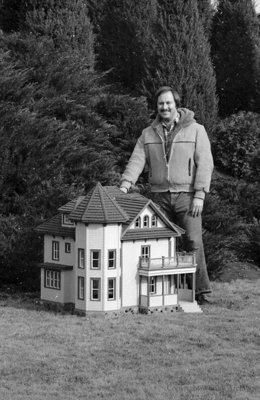 A black and white negative of Owen Hachey standing beside a yellow clapboard house in the Miniature Village. The house is a replica of the Thomson G. Jackson house built in 1904 and located at 1200 Brock Street South, Whitby, Ontario. Owen Hachey was the Project Manager for the Miniature Village. He and his employees would design and build the miniatures in the workshop at Cullen Gardens. He also helped to design the Restaurant, Gift Shops, restrooms and the Tea Room. Owen Hachey in the Miniature Village, Date Unknown, Photographer Unknown. Whitby Archives A2013_042_228C.